It’s a brand new year! This is a time we all start talking about our goals for the year ahead. We want to lose weight, get organized, quit smoking and the list goes on. Each year, more than 40% of Americans will make at least one New Year’s resolution, but only 8% of us will keep it. One resolution we should all make and keep this year is to get financially fit. There are many things we would like to do to get our financials in shape, so this goal may seem a bit daunting at first. With a long “to-do” list, vague resolutions and good intentions won’t do it. We have to have a plan. That is why I have divided up this long “to-do” list and created a 12-month guideline that is easy, manageable and achievable. It isn’t hard to get overwhelmed by all there is to do, but by taking each financial target one month at a time, you are well on your way to becoming financially fit. 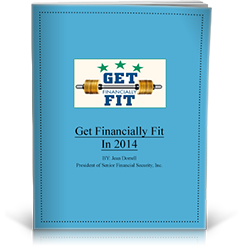 Please fill in the fields below to download your copy of ‘Get Financially Fit in 2014’.